Former President George W. Bush speaks during "Stand-To," a summit held by the George W. Bush Institute focused on veteran transition, in Washington, June 23, 2017. 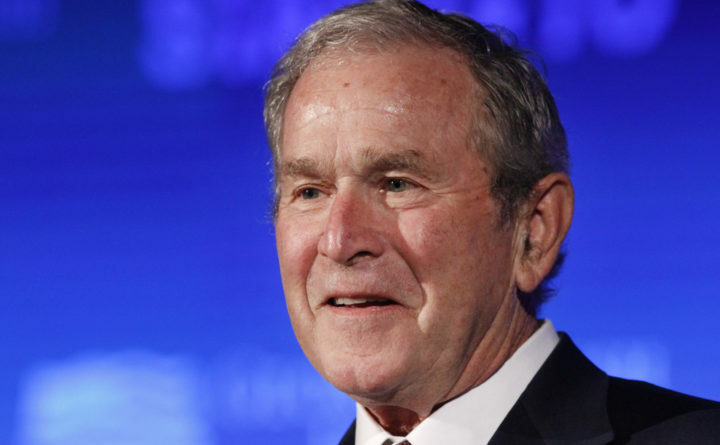 Bush will be in Florida on Friday to fundraise for Gov. Rick Scott's bid to oust Democratic Sen. Bill Nelson in a closely watched and expensive campaign. TALLAHASSEE, Florida — Former President George W. Bush is quietly helping boost Republican candidates in places where President Donald Trump has struggled. In so doing, the former two-term president is raising his profile, ever so slightly, in the national politics he eschewed for years. On Wednesday, Bush held an event in Fort Worth, Texas, for Republican Rep. Will Hurd in a congressional district Trump lost in 2016. On Friday, Bush is set to appear in Florida, which Trump narrowly won, on behalf of Gov. Rick Scott in the state’s expensive Senate race. The president has demonstrated that with one tweet, he can sway the fortunes of Republicans who dare cross him. For Republican candidates in places where voters don’t love Trump, that puts them in uncomfortable positions. Florida’s GOP chairman, Blaise Ingoglia, said Bush will be a “plus” for Scott’s bid to defeat the Democratic incumbent, Bill Nelson. Marc Short, Trump’s former legislative director and now a senior fellow at the Miller Center at the University of Virginia, said Bush and Trump “have more overlap than is often reported.” Both, for example, are fans of Brett Kavanaugh, Trump’s Supreme Court nominee whom Bush first put on the federal bench. Short said Bush’s time away from politics heightens his appeal. A former CIA agent, Hurd criticized Trump in a New York Times OpEd in July after the president’s deferential news conference with Russian President Vladimir Putin after their meeting in Helsinki. Trump, Hurd wrote, was guilty of a “failure to defend the United States intelligence community’s unanimous conclusions” that Russia meddled in the 2016 election.